In an effort to keep up with their competition, most companies dilute and devalue the point of difference that brought them to market in the first place. Like a flock of birds that unconsciously follow in prefect formation, so do many industry trends. But why? In today’s market, how do you truly differentiate? My mom used to always say, “If your friend jumps off a cliff, are you going to as well?” and the response is obvious, “No way, that would be stupid.” Well, in business you would be surprised how this cliff-jumping mentality has crept into every category of product we buy wall-to-wall across the store. Through flavor profiles, packaging sizes, pricing and formats, we want to be compared to others within our competitive set. Standing out raises too many questions and makes the purchase an effort. But isn’t that what the new consumers want today? A choice, with options that go beyond quality and price but also highlight a product’s purpose, mission and uniqueness? If so, then why all the mainstreaming? 1. Remember where you came from and why. We work with a lot of companies that launch products because of their love, passion and commitment. Some have recipes that were handed down from generation to generation. Others have inventions that are unique and solve a problem. Companies need to remember their roots as a reminder of what prompted their products to begin with. That doesn’t mean that a product shouldn’t be innovated, improved or enhanced. But staying true to who you are will prevent your company from jumping on a bandwagon that doesn’t make sense for your brand. 2. Have purpose that people can relate to. Even if your mission is just to create the best damn chocolate chip cookie ever, that needs to be clear to your customer. Decades ago, the Canadian supermarket chain Loblaws did just that. They aimed to deliver the best cookie anyone had ever had from a grocery store, which resulted in a decadent chocolate chip cookie that launched a loyalty that had never been seen in North American store brands before. Today, store brands spend so much more time reacting than innovating. They want to meet national brand standards, but stop short of exceeding them. Why? At the end of the day, what do you build in equity and goodwill by always chasing? The truth is, not everyone is going to like you. But guess what? There are over 200 million people in the US and if only 10% of those like you, that is ok. Often, those brands that take the biggest risks, who look ahead of the curve, they are the ones who will break out of the pack and become the standard that all others attempt to follow. So, take a chance and make a difference! Play to your strengths, not your weaknesses. Stand up for the product or service you sell because it is differentiated, not because it compares well to others. We all want to be special and not part of the herd. How does your brand differentiate? At Strategia Design, we work with a lot of clients who are launching their first product. This is an incredibly exciting process, especially for a designer, because we have the privilege of helping to define the brand and bring it to life. Whether you simply need a logo or a complete package design, however, there are a few key questions that you should consider before any designer puts pencil to paper. 1. What makes your brand special? Understanding what makes your product or service special can be very illuminating for both you and a design team. You’d be surprised at how many companies have not focused enough on their point of difference and cannot articulate it. A brand’s unique point of difference, the benefits or traits you might want to emphasize, or what kinds of feelings you want the design to evoke will ultimately determine your brand identity and who you connect with. This can be a tricky question, but it’s well worth the effort. Consider the answer carefully. Defining your unique value can help guide all of your branding and marketing efforts, and even your business development decisions, for years to come. Many entrepreneurs feel compelled to say: “My product will be useful to anyone!” But let’s face it, that just isn’t true. Identifying your target audience, as well as their likes and dislikes, is crucial to connecting with them through design and marketing. For example, the look and feel of a product for kids will be very different than one intended for adults. Some designs or color schemes may make a consumer think of it as a woman’s product or as a man’s product. If it’s a product for high-income families, we may want to aim for a more premium look. Even knowing your customer’s hobbies or interests can help inspire a more custom look for your brand. 3. What are your style preferences? Brands must connect with your consumers but they also have to feel right for you, the owners of the brand. If your brand is already established, you may have a style guide, color palette, and fonts that we can use in our designs. If not, it can be very useful for us to have some sense of what you like and what you don’t like from a visual perspective. Often an audit is helpful in helping you define what you like or don’t like. What do your competitors look like? What other brands or products do you feel drawn toward? What websites do you think are striking? Using Pinterest can be an easy way to collect images that designers can draw inspiration from. From there, we can understand how you see your brand and marry that with how your target customer sees the brand and create the right look and feel. 4. What is the scope of what you need accomplished? Start-up budgets are small, and we understand that. Perhaps all you need right now is a logo, and that’s OK. It is still helpful for us to know specifically what you need done now, what you might need done next, and your long-term goals. You want to be able to grow into your brand and not have to retro fit as you grow. We also ask a lot of questions. If we know that your new logo needs to work well on a 1-color print package, or if it needs to fit within a horizontal website header, we can design logo options with that in mind. Our team has experience in all aspects of branding, design, and marketing, and we’re happy to discuss big picture challenges with you. 5. What are the limits that a design team needs to keep in mind? To stand out, you have to know who you are standing out from. Perhaps your competitors all use the color blue and you want to stand out, so we’ll eliminate blue from our designs. Perhaps you’ve had past challenges with coming across as too feminine, so we need to stick to a gender-neutral style. Perhaps we need to incorporate certain elements from legacy designs in the updated work. Limitations or parameters can go beyond the visual and be very much a part of the brand mission, point of difference, and the benefit you offer. Whatever your limitations are, it’s important for us to know about them from Day 1. This helps to reduce revisions, so we can create a design you love faster. 6. Who are the decision-makers for your brand? Even if you’re the CEO, there may be other people that you want to include on final design decisions. Identifying who those people are at the start of a project can help keep everyone on the same page throughout the whole process. Don’t forget that customers are also decision makers for your brand. What they say about it, tweet about it or how they react to it will shape its meaning over time. Be sure your team is on board, but make sure your customer is included in that research. Keep the internal list of VIPs to only 1-3 individuals. Limiting this group will lead to less confusion and quicker decisions, making the design process easier for everyone. And remember that survey sites like Survey Monkey are your friend for customer research. 7. What is your timeline? Everything takes longer than you think. Have you ever made a 4-course meal and served it 2 hours late? Well that can happen in design as well, but we don’t want it to. Share your timeline early in the project and back into it. 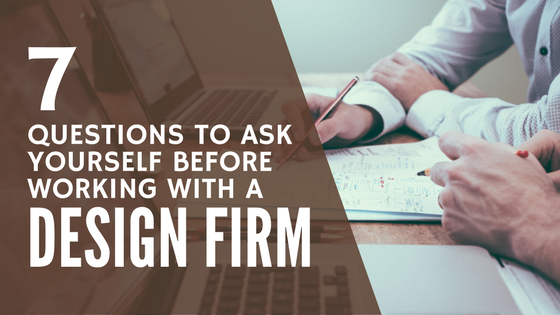 Make sure your design firm asks questions like, “Do we need to meet a deadline for a tradeshow or a retailer presentation?” Some activities, like printing or shipping, can add time constraints that will be important for a design team to consider. Even if you don’t have a hard deadline, we recommend that you decide on an estimated timeline. This will result in a more focused project that will help you achieve your goals. Don’t know the answers yet? Don’t worry. We can help! Some of these questions can benefit from an expert’s eye. If you don’t yet know the answers to any of these questions, our team would be happy to schedule an introductory call, a brand consulting session, or conduct a brand audit that will guide you to a clear and actionable plan. Ready to chat? Click here to get in touch. Does your company have a formalized style guide? If the answer is no, this is something that you should strongly consider. Although creating a brand style guide may seem tedious, it is absolutely critical – especially as your company continues to grow and acquire more clients and employees. A brand identity and standards guide tells users exactly how to use visual elements (logos, fonts, colors, etc.) in order to retain equity and maintain consistent branding on all company documents and in all marketing channels. By not providing a formal style guide, you can create confusion and inconsistencies in how your brand identity elements are communicated. First and foremost, a style guide is defined as a set of standards for the writing and design of documents that enforces a specific style to improve communication. It’s particularly helpful for employees and gives a company one strong, cohesive voice and image. Whether you are a service provider or produce and sell products, a style guide will help ensure that the message being put out there is the one that you approve. Consistency breeds trust, trust breeds loyalty and loyalty breeds repeat purchase. Collateral – letterhead, business card layout, press releases, email signature format, etc. Include images and examples – don’t leave the guidelines up to interpretation. Show employees exactly what the colors look like and how your logo should be placed with clear examples. If you use Pantone colors, specify the number, the coating and the 4-color process build. Work with a copywriter – consider bringing on a copywriter to craft the copy. You need someone who can communicate your brand values effectively so that there is no confusion about what is or is not allowed. Anticipate questions – think about questions that your employees may have when looking over the style guide and answer them clearly in the text of the guide. Make it accessible – provide both individual and communal printed copies of the style guide, or set up a simple website that people can search. This prevents people from losing their copies and gives everyone constant access. Finally, create a pdf that can be sent to your vendors, suppliers and press, if needed. What other elements do you include in your style guide? Do you have any additional tips for creating an effective style guide? What are some of your favorite examples of guides from other brands or companies? Let me know what you think by responding in the comment box below.